Unfortunately, nearly ten years later, it is still a ‘fundamental promise’. In our highly industrialized society, there are hundreds of sources of water contamination. Drinking water sources are subject to contamination and require appropriate treatment to remove disease-causing agents. The Environmental Protection Agency is charged with overseeing and regulating the quality of our drinking water. The EPA has established ‘acceptable’ standards for only 80 of the toxic bacteria, minerals and other contaminants that pollute both surface and ground water. Water contaminants enter the water supply through multiple sources, both natural and human-produced. Just as ground water generally moves slowly, so do contaminants in ground water. Because of this slow movement, contaminants tend to remain concentrated. Natural Sources Deposits of minerals, decaying organisms in water. Examples: Barium, Cadmium, Chromium, Cyanide, Fluoride, Iron, Radium. Old sewer systems that carry both storm water and sewage, designed to overflow into surface streams and rivers as a ‘safety measure.’ Combined sewer systems serve roughly 950 communities with about 40 million people. 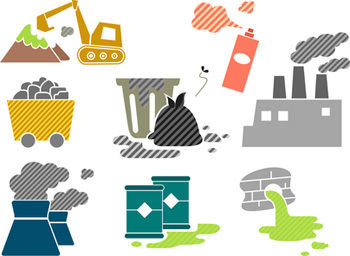 Untreated human wastes, industrial waste, toxic materials, debris from sewer systems. See coliform bacteria. Among the contaminants that have raised alarms in recent years are arsenic, lead, copper, mercury, e. coli, and giardia. All of these water contaminants must be removed from water before it is potable or safe to drink. In addition, some of the treatment methods – chlorination in particular – create their own byproducts which are at best unpleasant, and at worst toxic. Municipal water supplies are required to test their water for as many as 80 different contaminants that have immediate health consequences, but the levels of contaminants allowed in water is not 100% safe for all people. In addition, there is a list of ‘secondary’ contaminants that are suggested for regulation, but are not regulated because their effects are only cosmetic and don’t affect the safety of the drinking water. Finally, there are several dozen more contaminants which have health effects, but which are still under consideration for regulation. It’s no surprise, then, that even the EPA recommends that those with compromised immune systems, children and the elderly take special precautions with public drinking water sources.